My landscape etchings are the result of repeated observation of places that I know well – usually on the South Downs or the Sussex coast. Solar plate etching is an eco-friendly, modern way of working which uses sunlight (or UV lamp) and tap water to process steel light-sensitive plates without harmful chemicals. After processing, the plates are inked and wiped by hand and the image is printed on to dampened etching paper ‘intaglio’ using a traditional etching press. I also often combine my printed images with loose gestural painting on the paper, blurring the boundaries between the two mediums. 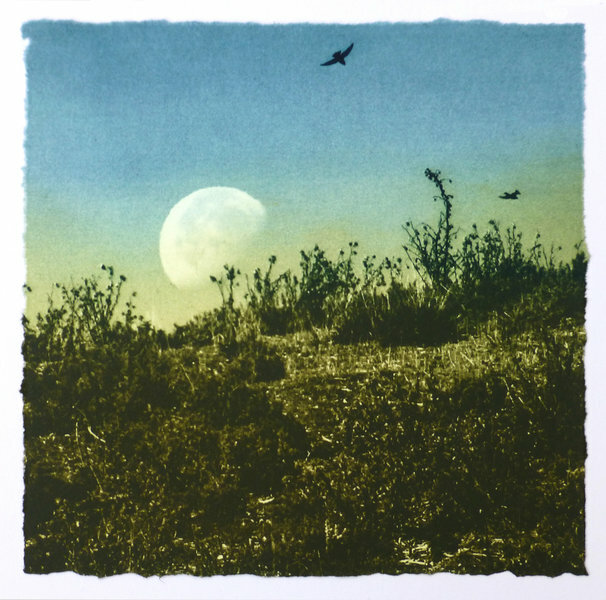 Each of my limited edition solar etchings can go through up to 14 different steps between the original idea and the finished framed piece and is individually hand-made. The process that I go through to make the plates, tear and paint the paper, ink the plates and print helps bring me closer to my inner vision of the place I am referencing. The images are often printed over the edge of the paper with no surround. Due to the nature of this process, there may be some small variations between the prints and so I have called these variable editions (VE).